Prader-Willi syndrome is a complex genetic disorder affecting nearly every system in the body. A challenge with this level of complexity requires a well thought out strategy to overcome. The Foundation for Prader-Willi Research, with the input of community stakeholders, has developed a strategic research plan for Prader-Willi syndrome for the next 5 years that will allow us to execute our programs in the most efficient manner possible. Over the last decade, we've seen many advances in our understanding of the fundamental mechanisms underlying PWS. These results have paved the way for the first drugs being currently tested in clinical trials for PWS patients and the development of promising therapies to address the root causes of the syndrome. In this time of unprecedented hope and promise for PWS patients, we’re excited to announce an ambitious 5-year strategic plan to accelerate the development of therapies that will address the causes of PWS and alleviate its symptoms. The estimated cost of completing the entire plan is $26,000,000. Through the management of a world-class grants program, the implementation of translational research programs, and the development of critical PWS research tools, FPWR will advance PWS research in order to develop new treatments and improve the health and well being of those with PWS. Shorter-term goals of evaluating existing approaches to improve health and quality of life will be balanced with support of longer-term, potentially transformative therapeutic development. FPWR is focused on funding research that will lead to treatments and a cure for PWS. 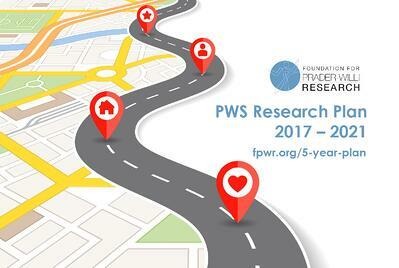 Thanks to our many supporters, our organization has experienced exponential growth over the past several years and we are excited to begin the next chapter of PWS research. Our increasingly directed research programs will ensure that the priorities of the PWS community remain at the forefront and will accelerate progress made towards future treatments. Steps are already underway to advance progress on the Research plan in 2017. Learn more about the plan, its programs and the critical research tools necessary for its success by visiting the research plan page on our website. Help change the future of our loved ones with PWS by making a personal contribution or fundraising for FPWR! Get started by visiting our fundraising page.